Every single meal I open my pantry and think "what am I going to cook?" And the same 3 or 4 recipes pop in my head! My poor family lives off of spaghetti, tacos and frozen pizza! Ha! 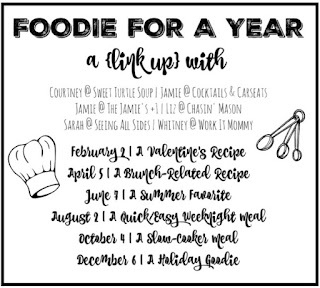 So, Courtney, Jamie, Liz, Sarah, Whitney and I are hosting a Foodie For a Year link up. 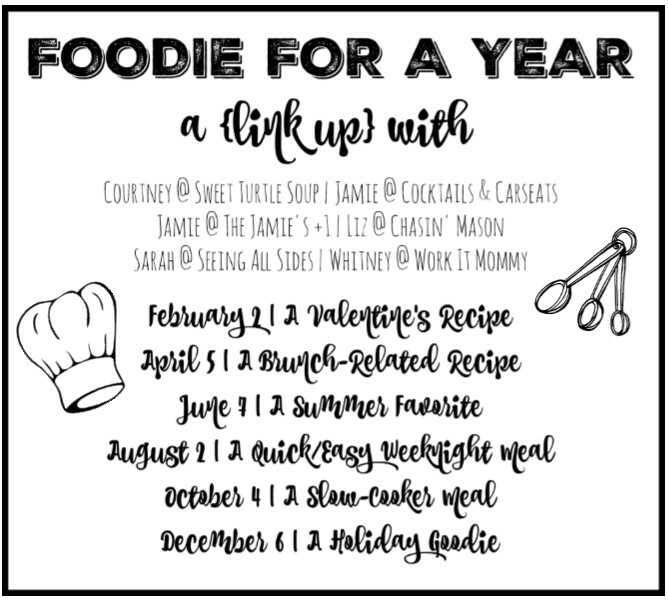 All you have to do is share your new favorite recipes that coordinate with the theme for each date and link up with us! Our first link up will be on February 2nd and we will all be sharing our favorite Valentine's recipe. I am already drooling just thinking about all the yummy recipes that you all will be sharing. And my family is counting on you to share something other than frozen pizza! We all hope that you will join in and be Foodies For a Year with us! YAY! So excited to host with you and to see everyone's recipes! Im drooling already too! Ditto on tacos and pasta, haha! Well we can't let the family down! I'm looking forward to this and finding new recipes to try!